A fusing glass paperweight fired in a glass kiln using a pyramid fusing mold and glass cullet. The paperweight is first fused, cold worked, fire polished and then annealed. When finished it is highly polished and quite heavy. 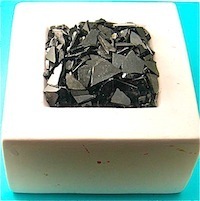 Cullet, is pieces of broken glass, it is used to minimize air bubbles that can be present in frit casting. To make cullet or frit - insert scrap glass between sheets of newspaper place on concrete, tap with a hammer until it is reduced to the required size. Always wear safety glasses as some material may escape from the paper. The pieces produced are larger than commercially bought frit. If using dichroic then transparent glass will be needed for the casting so that the dichroic can be seen. Opaque colors can be used if dichroic is not needed. This project has been made with System 96 products. Apply about five coats of primer evenly to the mold. Ensure air holes (if present) are not blocked with wash, clean from inside with small pin. Do not remove wash from walls as cullet may stick to mold. All uneven interior surfaces must be smoothed or they will be transferred to the casting. When mold is dry rub finger over uneven surfaces or use very fine sandpaper to produce a smooth surface. Always wear an approved face mask when sanding or removing shelf primer. Carefully fill with cullet so as not to scratch the primer, if using dichroic, place it between layers of cullet to give a color depth to the piece. Keep dichroic away from the edges as it can move through the mold during the fusing cycle. Once filled, pile cullet up in the center as per photo. Sit mold on prepared shelf and place in kiln. As this is cullet, the fusing temperature can be taken up rapidly to full fuse. However, take it up at around 500° F(260° C) to about 1500° F (816° C). Hold for fifteen minutes, or until the top of the top layer is smooth and flat. This is the bottom surface of the weight. If the surface is not smooth, it may need to be fired at a higher temperature or held longer. Turn off kiln, do not vent or open door until the it has cooled to room temperature. Opening the kiln may result in the weight cracking. Remove casting from kiln and set aside for twenty four hours to allow item to cool completely before taking from mold. 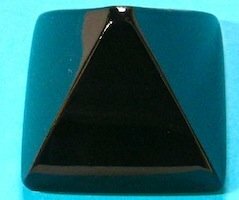 If the sides of the pyramid have some unusual depressions, this may be due to air bubbles being trapped between the casting and the side walls. If the mold has no air holes, you may wish to drill a fine hole on each side and in the bottom to overcome the problem. The casting may have developed small sharp needles around the top edge which will need to be ground away with a tabletop grinder. If primer has stuck to the sides, use a fine wet diamond hand pad to remove it. Once clean, handle with soft cloth or gloves to prevent finger marks being left on surface. In this segment the casting will be fire polished and then annealed to remove stresses from the casting. Place on a prepared shelf and put in glass fusing kiln. 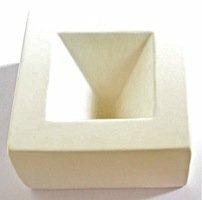 Due to the size of the object which is 2 5/8 inches across x 2 1/8 inch high it must be heated slowly to prevent thermal shock occurring. Raise temperature by 200° F(96° C) per hour to 1100° F(593° C), hold ten minutes, continue at 200° F to around 1350° F (732° C), hold for a further ten minutes. It should now be nicely polished with rounded corners. Do not over fire, as it will begin to flatten out. Drop temperature AFAP to 900° F(482° C). Hold the fused paperweight at this temperature for four hours to allow annealing to be completed. Annealing is very important when working with thick pieces. Switch off and allow kiln to cool naturally. Allow kiln to cool to room temperature before removing casting. You should now have a very shiny, smooth fused art glass paperweight.